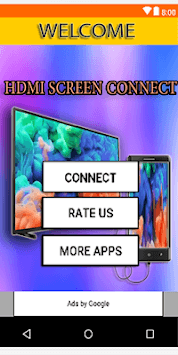 Welcome to the Hdmi screen connect application - (mhl / usb / otg / mirroring /) and the best HDMI connect to android. 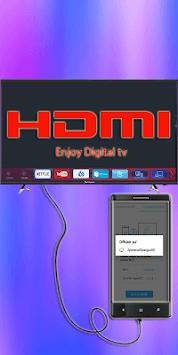 - The USB connector and USB connector of the smart TV allow you to connect the TV as your phone's second screen with a USB OTG or USB HDMI MHL cable and enjoy your screen on the HDTV. the screen of your mobile on a Smart TV. 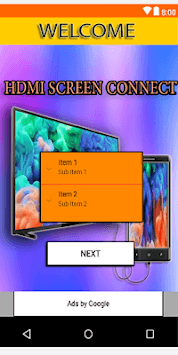 - Screen Mirroring is a technique that allows you to play your smartphone on your TV screen. You can easily access all your photos, games, videos and other applications on a big screen using smartphone screen on tv App. * TV and MOBILE should be on the same wifi network. * Click on CONNECT to connect your phone to the TV. * Universal app (works on Android, smartphone, tablet). * Free USB TV connector. * Browse your phone / tablet TV multimedia. * usb phone connector for tv sam, sung. * Automatically discover supported devices nearby. * Create multiple albums to organize the media. * Control playback on the TV from your phone / tablet. * USB phone connector on TV. * Supports various video and image formats. * WiFi / Ethernet support. * Automatic update of the default albums of the phone and the tablet. If you continue to have problems, please send us an email so that we can help you. Thank you.